I’ve been waiting a long time to play as Batgirl in a modern video game. Now the chance has arrived in the form of a new add-on for the latest Batman title. Is it what I wanted? Not really. Starting this week, folks who’ve ponied up cash for Batman: Arkham Knight’s season pass will get the chance to play as Batgirl in an all-new add-on called A Matter of Family. (The add-on becomes available for everyone else on July 21.) 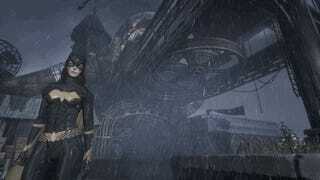 The extra chapter, which takes place before the main game, focuses on Batgirl’s attempt to save her father, police commissioner Jim Gordon, who has been kidnapped by the Joker. She’s helped out by Robin. Together they’ll need to hunt through a derelict amusement park to rescue Gordon and other GCPD hostages. Spoilers follow for gameplay and puzzles in the Batgirl DLC. While it’s not as bad as the Harley Quinn DLC that released when Arkham Knight first went on sale, A Matter of Family still feels slight and worries me that publisher Warner Bros.’ pledge of six months of new content is going to feel like a drip feed of under-realized ideas. I managed to finish the entire chapter (played on PS4) in about 90 minutes this morning, dawdling a bit to explore the abandoned entertainment attraction. The biggest gameplay differentiator here is an increased focus on hacking various interfaces throughout the park. It’s a small nod to the programming savvy that Barbara Gordon eventually wields in older comics and in the Arkham universe as her primary form of crimefighting after a fateful encounter with the Joker cripples her. Unfortunately, A Matter of Family doesn’t give me the kind of character insight I wanted for a video game take on Barbara Gordon. Yes, there are scenes where she stops Robin from rushing in to protect her or handle a challenging situation.But we get no recap of her origin or any sense of what drives her. Remember, this is the first time that Batgirl’s getting the spotlight in a Batman Arkham game. There’s just not enough in this by-the-numbers offering here to showcase why she’s a special part of the Bat-mythos. I‘ve written before about my affection for Batgirl and how she improves the Bat-family ensemble. That affection is part of why I was disappointed to see Barbara Gordon kidnapped and used as bait for Batman in the main campaign of Arkham Knight. I have finished the main game and witnessed the sequence where--tiny spoiler—she helps Batman overcome overwhelming odds. That hero moment felt mild, though, and I held out hope that A Matter of Family would give players something more meaningful for Batgirl. Barbara Gordon matters because she’s smarter than Batman in some ways and her drive for justice comes from a place that’s not quite as grimdark as her mentor’s core trauma. Sadly, none of that gets shown in A Matter of Family.